The Vacu-Stack cures most wind-related backpuffing problems. Customers who live in the mountains, foothills, or around trees or tall buildings often complain of backpuffing problems on windy days. The Vacu-Stack may be the solution. These obstacles may deflect wind down the chimney, overcoming the draft. But, when wind hits the uniquely designed Vacu-Stack, it actually increases draft in proportion to the speed of the wind. 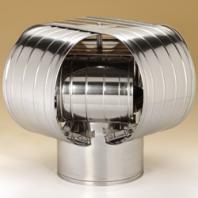 A word of caution - The Vacu-stack won't cure an otherwise poorly drawing flue. Therefore, do not be tempted to use it to cure anything but wind-related backpuffing problems. The Vacu-Stack is made of 26-ga., 304-alloy stainless steel. To install, slide the Vacu-Stack into the pipe and seal with a bead of High Temperature Silicone Sealant. The Vacu-Stack carries a lifetime warranty. For class-A chimneys using solid-pack insulation with sealed ends, use this standard model. Fits 8 x 12 inch oval regular stack.